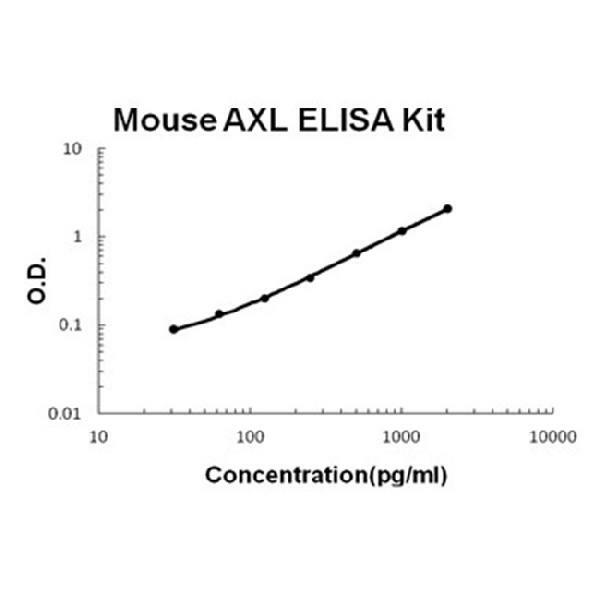 Sandwich High Sensitivity ELISA kit for Quantitative Detection of Mouse AXL. 96wells/kit, with removable strips. In distinct substructures of a broad spectrum of developing tissues (in the late embryogenesis). In cells forming organ capsules as well as in connective tissue structures (in adult). Cell membrane ; Single-pass type I membrane protein . Receptor tyrosine kinase that transduces signals from the extracellular matrix into the cytoplasm by binding growth factor GAS6 and which is thus regulating many physiological processes including cell survival, cell proliferation, migration and differentiation. Ligand binding at the cell surface induces dimerization and autophosphorylation of AXL. Following activation by ligand, ALX binds and induces tyrosine phosphorylation of PI3- kinase subunits PIK3R1, PIK3R2 and PIK3R3; but also GRB2, PLCG1, LCK and PTPN11. Other downstream substrate candidates for AXL are CBL, NCK2, SOCS1 and TNS2. Recruitment of GRB2 and phosphatidylinositol 3 kinase regulatory subunits by AXL leads to the downstream activation of the AKT kinase. GAS6/AXL signaling plays a role in various processes such as endothelial cell survival during acidification by preventing apoptosis, optimal cytokine signaling during human natural killer cell development, hepatic regeneration, gonadotropin-releasing hormone neuron survival and migration, platelet activation, or regulation of thrombotic responses. Plays also an important role in inhibition of Toll-like receptors (TLRs)-mediated innate immune response. .
Tyrosine-protein kinase receptor UFO is an enzyme that in humans is encoded by the AXL gene. The protein encoded by this gene is a member of the receptor tyrosine kinase subfamily. Although it is similar to other receptor tyrosine kinases, the Axl protein represents a unique structure of the extracellular region that juxtaposes IgL and FNIII repeats. It transduces signals from the extracellular matrix into the cytoplasm by binding growth factors like vitamin K-dependent protein growth-arrest-specific gene 6. It is involved in the stimulation of cell proliferation. This receptor can also mediate cell aggregation by homophilic binding. Axl is a chronic myelogenous leukemia-associated oncogene and also associated with colon cancer and melanoma. It is in close vicinity to the bcl3 oncogene, which is at 19q13.1-q13.2. The Axl gene is evolutionarily conserved between vertebrate species. This gene has two different alternatively spliced transcript variants.